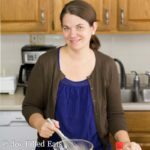 Hi ya’ll…my name is Emilie from the food blog Tales of a Texas Granola Girl where I share gluten-free and low-carb recipes inspired by my Texas upbringing. I believe amazing, satisfying food doesn’t have to be filled with sugar, grains or preservatives and healthy food doesn’t have to be boring and bland! These days I live on a Ranch out in the middle of nowhere Texas, home-school my girls, raise animals, cook for Ranch guests and specialize in creating delicious recipes that are 100% gluten free, low carb and keto and always kid and Cowboy approved! You can find me at www.texasgranolagirl.com and on Facebook at https://www.facebook.com/texasgranolagirl/. 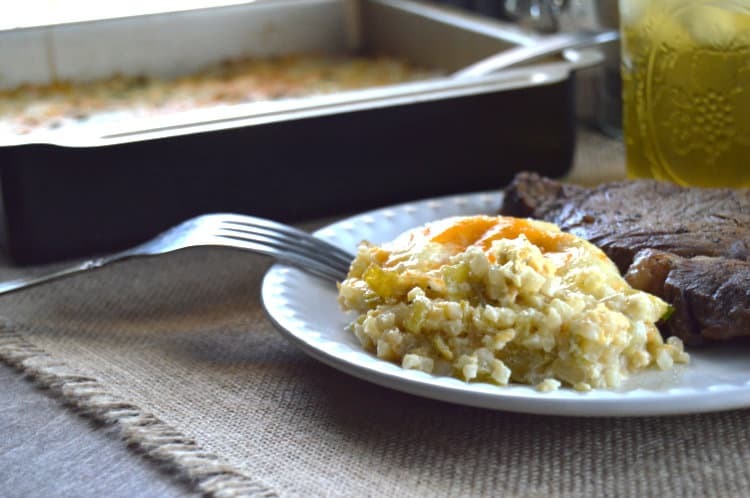 I’m so excited that Taryn invited me to Guest Post on Joy Filled Eats! I am thrilled to share this simple and scrumptious Green Chile Cauliflower Rice Casserole, inspired by one of my all-time favorite family dishes! Super simple to make…In the oven in less than 20 minutes! One of my favorite things to do is to take my favorite childhood comfort food recipes and “de-carb” them! We all have those dishes that evoke “food memories” …sometimes for me, it’s just the aroma that does it! Well, just because we are living a low-carb or keto lifestyle shouldn’t mean that we miss out on all those amazing flavors from our past! 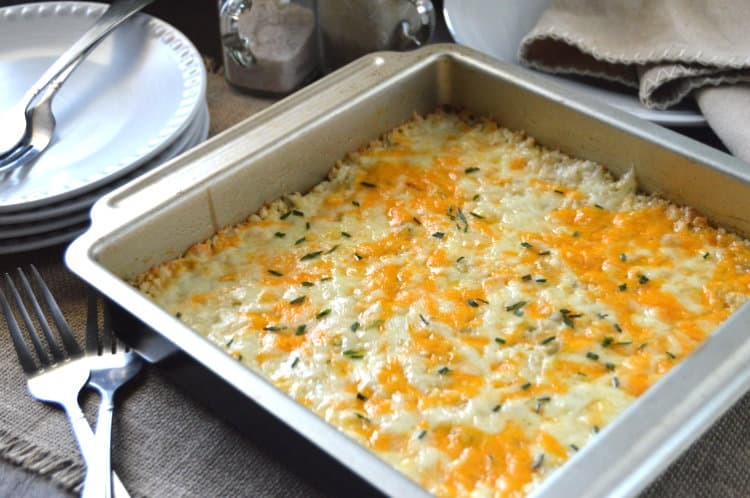 Green Chile Cauliflower Casserole was inspired by one of my favorite special occasion dishes. I remember it was always on the table at Christmas and other holiday dinners…or at least I hoped it was! It’s funny…I’m not quite sure why it was reserved mostly for special occasions because it is so easy to make…probably because it is rich and decadent and those dishes in our house were always reserved for holidays! The version from my childhood had white rice as the main ingredient so I switched it up with some cauliflower rice, made a few other modifications and I have to say this low carb version is even better than the original…sorry, mom! Look at all that yummy cheese! As you now know, I live on a ranch out in the middle of Texas with my husband, the Cowboy, and my two girls. We are about 45 minutes away from the nearest store, so we stock up on groceries when we go to town! 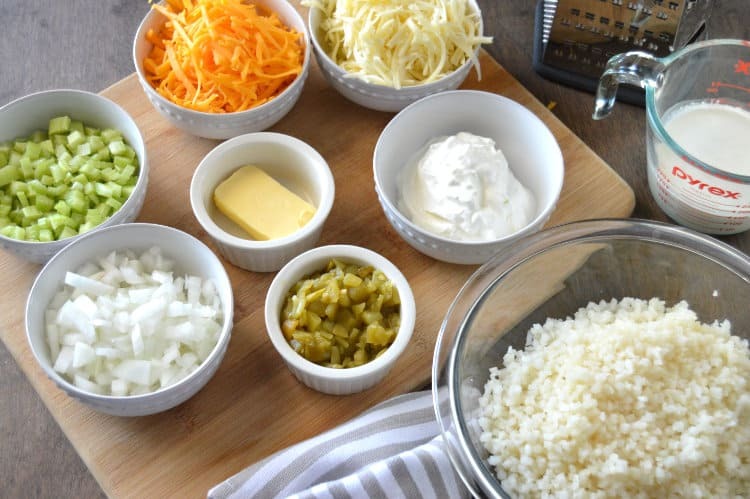 While I love fresh veggies, they don’t seem to stay fresh for too long, so to save time and money, I stock up on certain frozen veggies and cauliflower rice is one that we always have on hand! I try to load up when it goes on sale, so we always have it around for a quick side option or to use in our favorite recipes. 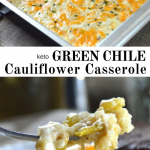 My daughter Maddie and I are the low carbers around here and we love the versatility of cauliflower rice and use it all the time, for anything from pizzas to casseroles, like this amazing Green Chile Cauliflower Casserole! One of my other favorite sides is GG’s Oil & Vinegar Coleslaw. And if you are looking for something to serve this with how about Chicken Verde Taco Bowls? Cauliflower rice baked in a cheesy, sour cream and green chili sauce and topped with more ooey, gooey melty cheese…sound delicious? IT IS! It’s all my favorite things …creamy, cheesy, decadent, comforting and so incredibly delicious. 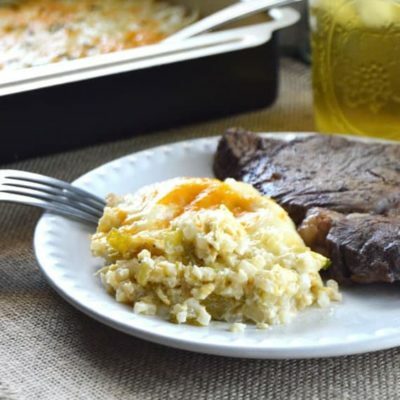 Served up aside a grilled steak, crispy chicken thighs or even your favorite pork chops, Green Chile Cauliflower Casserole will quickly become a favorite side in your weekly meal rotation. It takes minutes to put together and can be made ahead of time, so it can easily be used for meal prep as well! It’s Texas comfort food at it’s finest! Green Chile Cauliflower Rice Bake is a low carb remake of an old family favorite. 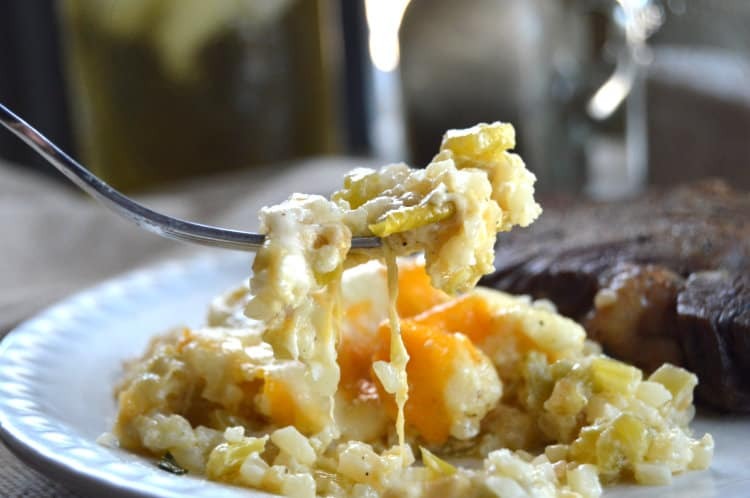 Cauliflower rice baked in a creamy, cheesy sauce studded with green chiles and topped with gooey cheese...it's Texas comfort food at it's finest. Quick, easy and great for weekly meal prep! Absolutely awesome! Added a cooked chicken breast and served as an entree. Prep time took more than 10 minutes though with chopping onions/celery and grating two kinds of cheese. Will definitely make again. Made this tonight and even my cauliflower hating husband loved it! Added shredded chicken, halved the butter, & subbed non-fat Greek yogurt for the sour cream and half & half for the heavy cream, and it still turned out creamy and delicious. Definitely going into the weekly rotation! This is SO good!! I added some Italian sausage and bacon. Deliciousness!! Will be on our perminate breakfast menu. Thank you for sharing this dish!! Slightly. I have sensitive taste buds and get a hint of cauliflower but it's much less than other cauliflower/ potato recipes. I made this and fell in love! However my dish didn't have the splash of green on top. Did you add a garnish or are those the green chiles sticking out? Thanks! It was delicious! It is nice to have a cauliflower dish that has a different flavor. Thank you for this tasty recipe. I am excited to try this! I will let you know how it turns out! I'm thinking of adding a few eggs (4? ), like my Chili Relleno casserole recipe has. Did it turn out ok with the eggs? I would actually like to try this recipe with some rice in it due to dietary needs. Could you help with that? I know how rice (even cooked) has a tendency to absorb liquid. Thank you. Hi Kathy, I am not an expert at using rice in casseroles, sorry! I'd probably just use cooked rice and add a splash of chicken broth. This was by far one of the best keto recipes I’ve made so far. A keeper! Can you use fresh cauliflower instead of riced cauliflower? A serving is 1/6th of the recipe. Enjoy! Thanks for the great recipe idea. I added shredded chicken to it and made it a full meal instead of a side. New family favorite. I'm just starting Keto and looking for easy delicious dishes, yours sounds delicious! Thank you for sharing! I'm going to make this one day this week! Barbecue some steaks and this will be our side! I have a chile releno recipe that I have used for years, but this one looks good too! I pinned this recipe to my Pinterest account. I made this and it was amazing! It’s too good. I just wanted to overeat, but I didn’t. I’m doing keto and wanted to jazz up my cauliflower. That should work. Hope you enjoy this! Delicious I'm going to add okra to this next time and use Greek yogurt. Adding okra is a great idea! I added 1/2 of shredded chicken to it and was great with a salad. Yum! I want to try adding chicken too to make this a one dish meal. OMG! I made this for a dinner party. Thank goodness I made extra, because my family loved it! We paired it with steak and salad. What a PERFECT side dish! This was fantastic! Loved the flavor profile the green chiles gave it! Thank you! Had it with steak and salad for dinner tonight! Any chance you could use Greek yogurt instead of heavy cream? I am worried about the fat content as well. I probably missed it, what is the serving size? I see that you answered 1/16 is the serving size. Need better measurment. What is a serving size in cups please? Also how many carbs, fat and protein is in each serving? Thanks! That is listed in the nutrition box in the recipe card. I'm sorry but I don't have that information. 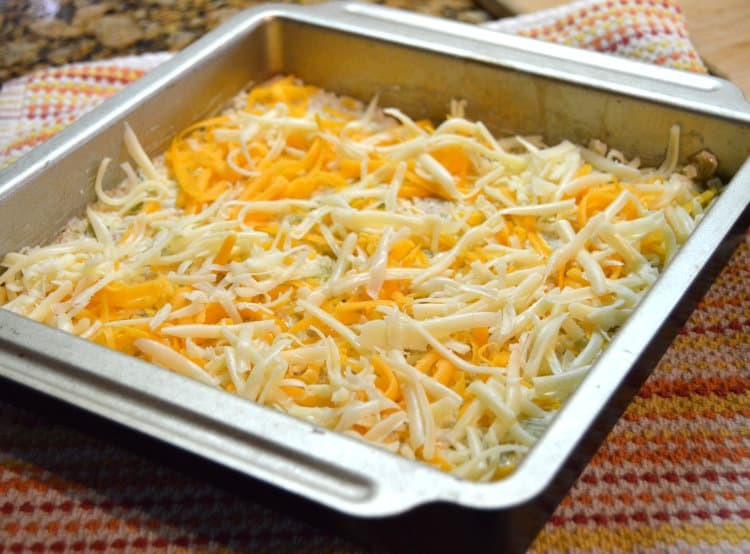 If you have a kitchen scale you can weigh your casserole dish, then weigh the casserole after baking. Subtract the weight of the dish and divide what's left by 16. Then you have the exact weight of each serving. Can you use fresh chilies in this? If so what type of chilies would be best? Yes. I'm a bit of a wimp when it comes to spicy things so I would probably just saute a little chopped jalapeno with the onions and celery. This looks and sounds amazing; all of your recipes do. I have compiled an extensive shopping list with ingredients from six of your recipes. :) I was wondering if I could freeze this recipe before baking it? Could I prepare it and store it in the freezer for a couple of months? Thanks in advance! I have not tried freezing it but I don't see why it wouldn't work. You can definitely prep it and refrigerate for a day or two before baking. If you try freezing it please come back and let me know how it turned out! Many low carb recipes are high in fat. You could cut the amounts of cheese in half or double the amount of cauliflower if you'd like to reduce the fat amount. If you're eating low carb, you really need high fat! You NEED it! Otherwise, your body will think you are starving and will slow metabolism accordingly. They look wonderful. Going to try two of them today.